September 13, 1847 - Natus fui Jan. 22d, 1825. Was brought up to hard work on the farm. When I was 9 years old attended the Dancing School kept by Mr. Thompson of Keene, N.H. I liked dancing very much and was said to be very good at it...In March '46 came to Pittsburgh, Pa. Commenced business with my brother. I had pretty hard scratching for a while but soon came off the gainer. We accumulated something the first season...In the fall of 1847 assisted in forming a Phreno-Magnetic Society, was appointed vice Pres., was very successful in magnetising 12 persons some of whom I releaved (sic) of distressing pains. I am magnetising very frequently a young lady for the St. Vitus dance. I have helped her considerably already and hope to cure her of the malady. March 5, 1849 - Arrived there (Baltimore) in the morning. Spent a few days in preparing for the trip to Cal. Left my wife at her father's and took passage on the steamboat de Witt Clinton for St. Louis. Stopped over night at Cincinnati. Attended the theatre in the evening where I was robbed of my pocket manuscript...Cholera has broke out at St. Louis. 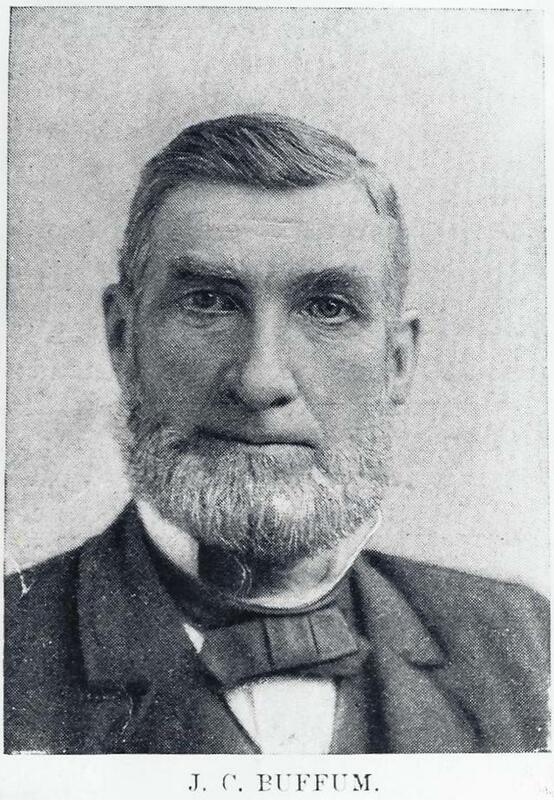 This image of J. C. Buffum accompanied a biographical sketch in a Pittsburgh and Allegheny Illustrated Review - Historical, Biographical and Commercial - A Record of Progress in Commerce, Manufactures, the Professions, and in Social and Municipal Life published by J. M. Elstner & Co., Pittsburgh, PA, 1889. 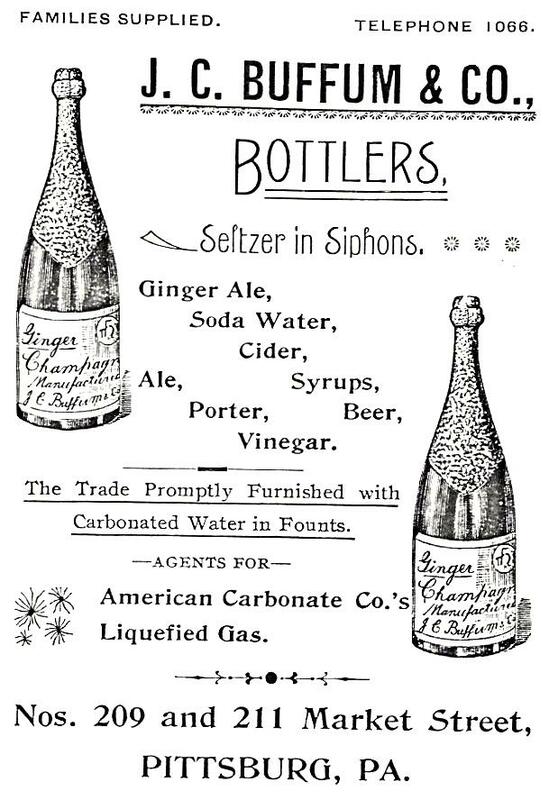 J. C. BUFFUM & CO., Bottlers, Ginger Ale, Soda Water, Cider, Beer, Ale, Porter, Families Supplied, (Telephone No. 1066), Nos. 209 and 211 Market Street. -- The bottling of ale and lager beer has become an important industry, and since the medicinal value has received the endorsement of the medical profession, its good effects as a tonic are generally acknowledged by the public, and the demand for these specialties has accordingly increased. The largest and leading house engaged in this line in Pittsburgh is that of J. C. Buffum & Co...This firm deals in bottled carbonated drinks, liquefied carbonic acid gas, pure cider and vinegar, Smith's India Pale Ale and Brown Stout, etc., and among their specialties are grocers' bottled sodas, extra family sodas, pure flavoring syrups, cream chocolate syrup, concentrated extracts, Saratoga spring water, mineral spring water, cream and stock ales, imported Bass ale, imported Dublin Stout...This business was founded in 1845 by J. C. Buffum and brother under the style of J. C. Buffum & Co. The business premises comprise a large double building, containing three floors and a basement, 40 x 100 feet each, amply supplied with improved machinery and steam power and steady employment is given in the summer season to some fifty skilled hands. All goods bottled and sold by this house are kept at a uniform standard, and are never allowed to deteriorate, thus serving to place this house foremost in the bottling trade of this section. The specialties handled are endorsed by the highest medical authorities for their purity and excellence, and a heavy and influential demand is supplied throughout Pennsylvania, Ohio, Virginia, and West Virginia. Soda fountains are promptly supplied with carbonated soda and mineral spring waters, and rented at a nominal figure...Mr. J. C. Buffum, the proprietor, is one of Pittsburgh's best-known citizens and representative business men. He has served as a member of the City Council...and is president of the Pittsburgh Bottlers' Association. The accompanying photograph of a beautiful amber PA2223 was mailed to Joe Nagy by the late Ray Hoste in 1979. After residing in a file for 34 years, it is time this photo sees daylight! R.I.P. Ray, you are missed. This advertisement is from an 1894 Exposition album.